Made by Malley's in Australia, Oceania, 1966-1969. The Esky is in the traditional rectangular shaped cold storage container with the outer surface clad in a brown metal material. The interior of the Esky is lined with metal. Blue/grey rubber seal around perimeter at top. Black plastic screw-in plug at bottom for draining Esky. There is a white plastic tray inside. A transfer on both sides of the esky says 'Malley's Esky Portable Cooler'. It has a metal brace that secures the lid by locking into the lid's carry handle. The lid is white painted metal and is lined with galvanised metal, it has a metal carry handle and some surface rust. The brown cardboard box is the Esky's original packaging. It has an illustration on all sides of a red Esky, and a smiling child dressed as an Eskimo, along with the musical slogan 'Take the party with you' and the words 'Malleys New Look Esky. Smooth, sleek, streamlined'. The newspaper lining the box is dated January 1970, indicating not the date of purchase but the time when the Partridge family moved to Sydney. Box made by Alliance Cartons Pty Ltd, Revesby and Bankstown. The first ice box sold under the trade mark Esky was manufactured by Malley's in 1884. Malley's was a manufacturer of household metal products. In 1952 Malley's launched the first Esky portable cooler. 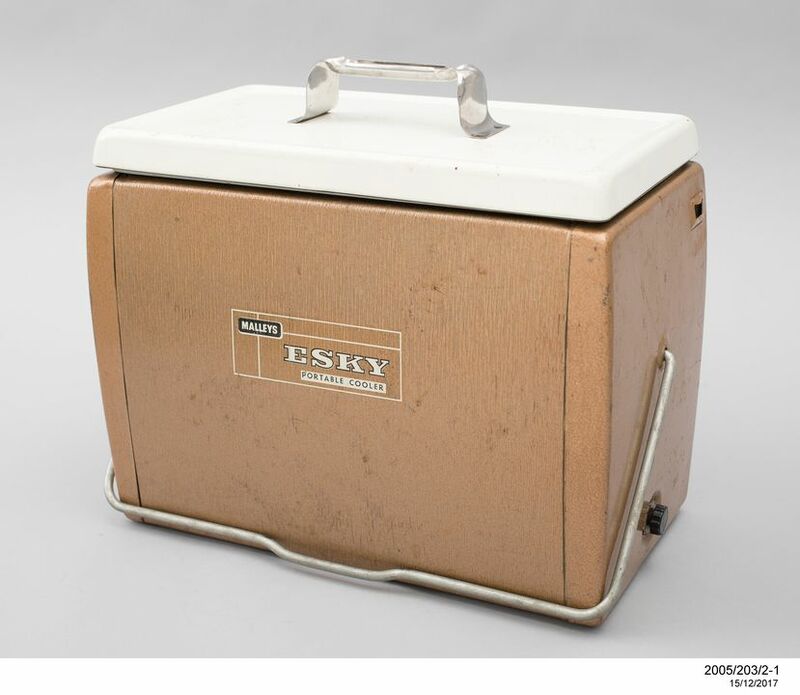 Named the 'Esky Auto Ice Box', it used cork sheeting for insulation, had room for six pint-sized bottles and included a removable three-tray food rack. Aimed at motorists, it was advertised in motoring publications with the claim that the product was 'Just as essential in the boot as the jack'. Over the years the Esky cooler had adopted a new shape and new colours. By 1960, it was claimed that '500,000 happy picnickers' were now using of the Esky cooler. Nylex took over production of the Esky brand in 1984. Used a few times by the Partridge family to keep food and soft drinks cold during trips from Macksville to Sydney in the 1960s, a time when most cars did not have air conditioners. Kept by Lachlann Partridge with its original box.